Something Gav and I have really gotten into this year is board gaming. We’re even choosing it over lazy late-night viewing and have bought quite a few two-player games that we can enjoy without feeling sad and forlorn that we don’t have any board-gaming friends who can pop over at 11.30pm to play. 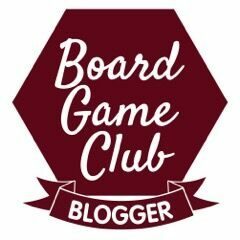 We’ve also got quite a few that the boys enjoy and we’ve been getting on well with them – and so we’re delighted to have been asked to join the Blogging Board Games Club and review a game each month on here for other families like us who’re into more exciting games than just Snakes and Ladders. I had NO idea that the world of board games was so exciting and not at all as complicated as I thought. 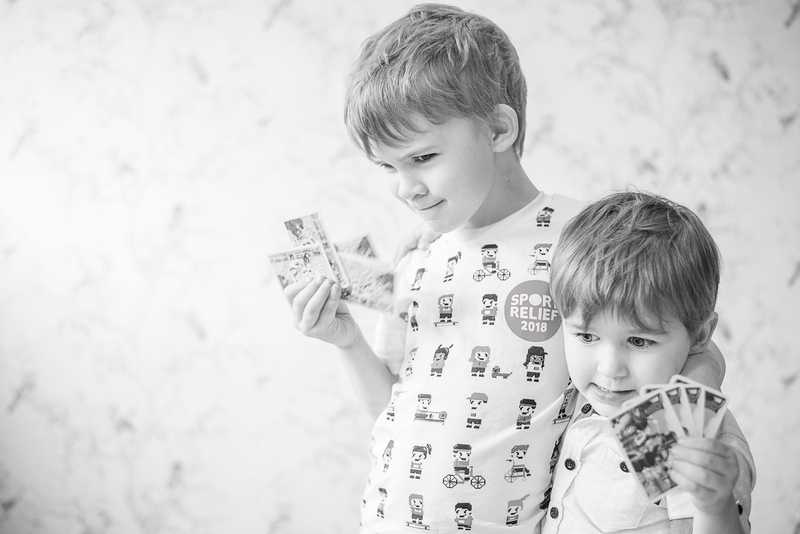 I used to see people playing games involving cards and tokens and weapons and it would all go over my head as I’m hopeless with instructions since having babies – but lucky for me, Gav will read the rules and explain them to me as we go along. Haha. 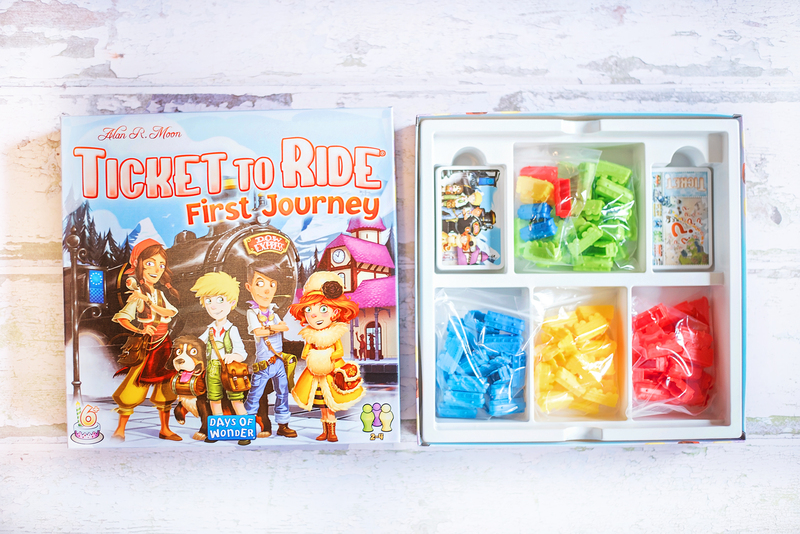 This month we’ve been sent the children’s version of one of our favourite games, Ticket to Ride: First Journey. Gav bought me the Nordic Countries version for Christmas and we fell in love with it. The boys were excited to have a less enormous version to play and so we put Ticket to Ride: First Journey to the test. The aim of the game is very simple – to complete train journeys. Everyone collects different coloured train-car cards and guided by their own train tickets, they claim their routes by laying train cars and connecting the cities. 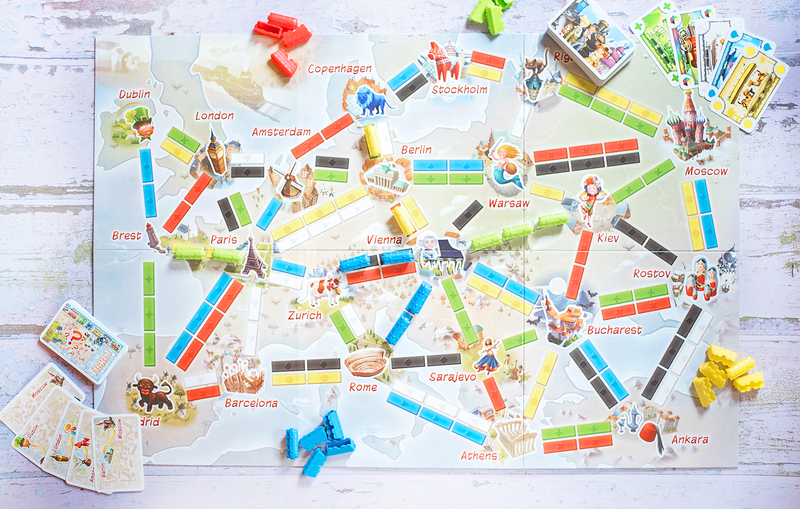 The game board itself is a beautifully illustrated map with train routes in different colours connecting the cities and countries. 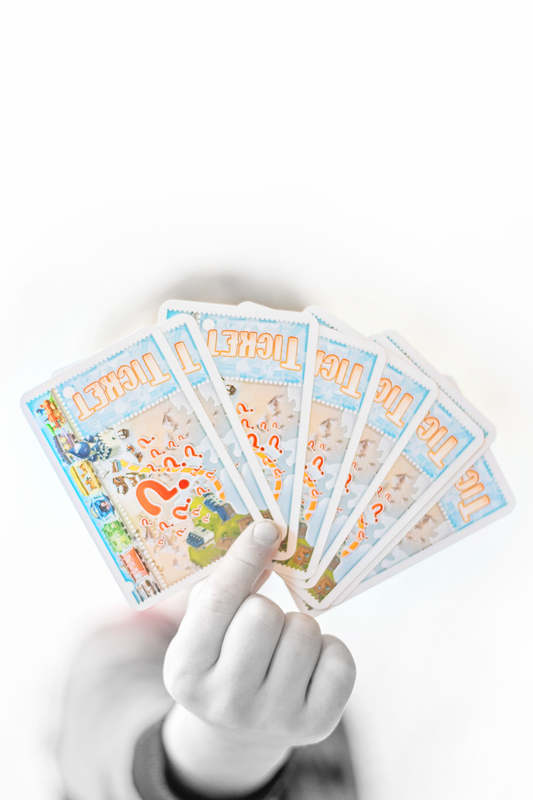 The game needs very little set up – everyone is given four random coloured train cards each, and two train tickets. The train tickets show the route and list the origin and destination cities. Your job is to connect them and complete your ticket by exchanging the correct amount of particular coloured train cards to fulfil each route. When it’s your turn, there’s a choice. Players can either take two random coloured train cards from the deck or swap their coloured train cards for a particular route. 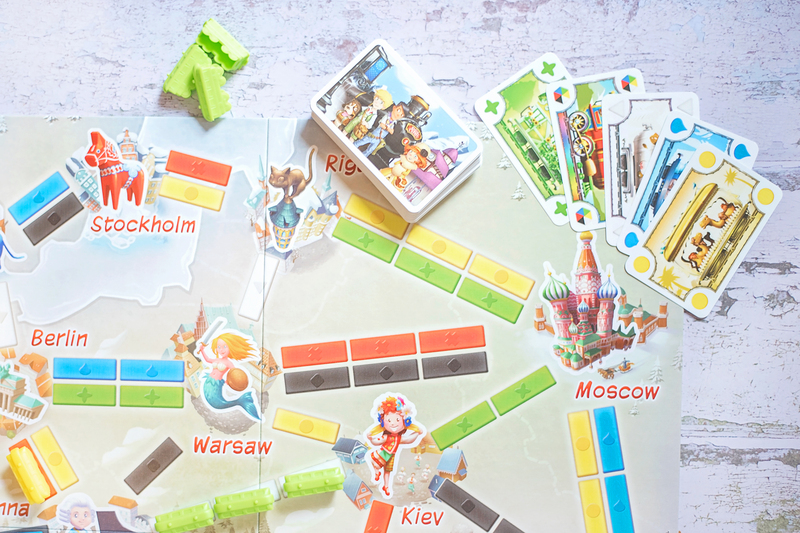 Cards must match the amount and colour of the spaces connecting the cities – three green cards for the three green spaces from Vienna to Kiev in the photo above, for example. When a train ticket is completed, players have to place it face up in front of them and take a new ticket with afresh journey to attempt. 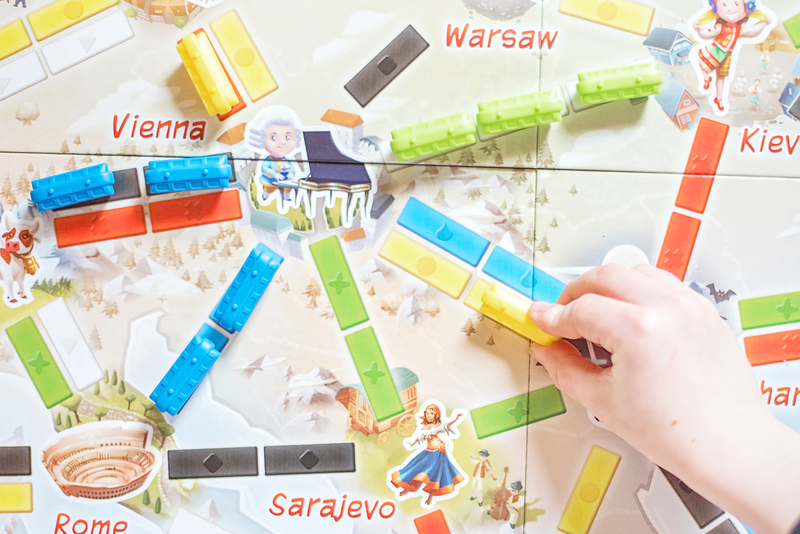 The aim is to complete six tickets to win – or the game comes to a close when someone has placed all 20 of their trains onto the board. At this point, whoever has completed the most tickets is the winner. Alternatively, if someone has placed all twenty of their trains on the game board, then whoever has completed the most tickets wins! The brilliance of the game. It’s great for problem-solving if someone has already claimed your route and you need to find a way around it to get to your city. The illustrations on the board are beautiful. 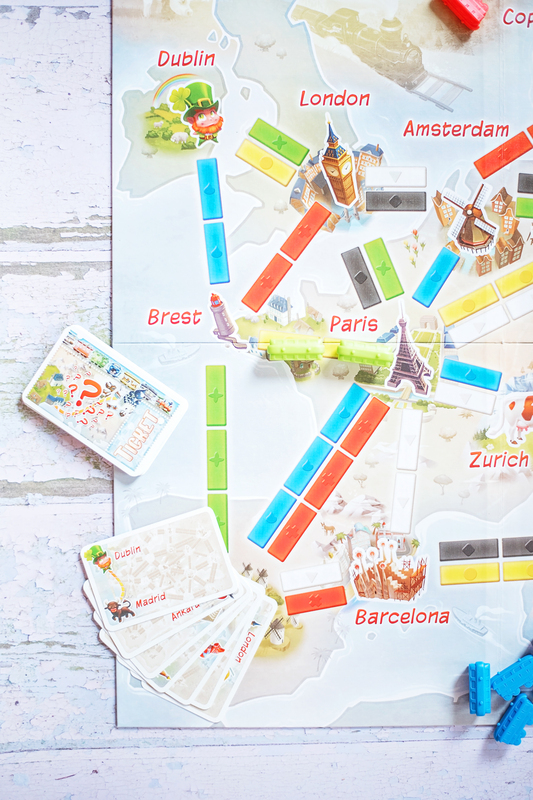 The rules are simple – Ticket to Ride: First Journey is easy to play, and it’s really easy to understand how to win. That everyone in the family can now play. It’s awesome. Nothing, it’s just fantastic. We couldn’t be happier to add this to our collection. This is a game we’d genuinely have bought this year if we hadn’t been reviewing it. 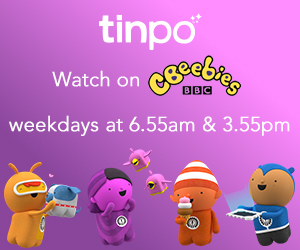 It’s perfect for families who want to introduce their little ones to playing board games and doesn’t overcomplicate anything with point scoring. We love it. You can buy yours here for £22.99 on Amazon.